Enter the Gungeon is a gunfight dungeon crawler following a band of regretful misfits seeking to shoot, loot, dodge roll and table-flip their way to personal absolution. 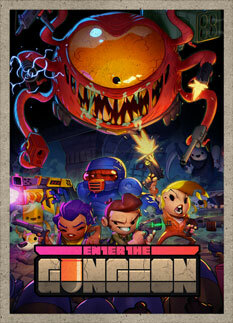 Enter the Gungeon is a gunfight dungeon crawler following a band of regretful misfits seeking to shoot, loot, dodge roll and table-flip their way to personal absolution by reaching the legendary Gungeon’s ultimate treasure: the gun that can kill the past. Select a hero and battle your way to the bottom of the Gungeon by surviving a challenging and evolving series of floors filled with the dangerously adorable Gundead and fearsome Gungeon bosses armed to the teeth. Gather precious loot, discover hidden secrets, and chat with opportunistic merchants and shopkeepers to purchase powerful items to gain an edge. The Enter the Gungeon’s Supply Drop Update adds nearly 200 new rooms to the Gungeon that include new weapons, enemies, companions, bosses, and shrines for even the most seasoned Gungeoneer. Players will come across new guns like the Bullet Gun, a gun shaped like a bullet that shoots guns and those guns shoot bullets, and new companions like Ser Junkan who gains strength and power as you carry more and more literal junk with you through the Gungeon. Elite gunslingers will also be able to tackle unique pasts for both Robot and Bullet and an all-new boss – the Mine Flayer! - A new NPC, Challenge Mode, shrines, a new companion, and more! Enter the Gungeon is a unique, highly entertaining game. It looks great and it played perfectly.